A magnetic personality, an entrepreneur, a philanthropist, and a social activist bearing a will of iron and a heart of gold. Mrs Aruna Oswal has been working tirelessly to accomplish the dreams of numerous lives that she has touched over the years. ‘Finding your true happiness in the happiness of others’ is the belief she lives by. Born in a simple family at Ambala (Punjab, India). She was blessed with loving parents who supported her various talents of dance, music, acting and nurtured her personality for all the endeavours in life. A Masters degree in Arts paved way for her further refinement and intellectual approach. She is married to revered industrialist Mr. Abhey Oswal and is blessed with three wonderful children. A true humanitarian, she has touched numerous lives with her generosity, love and compassion. 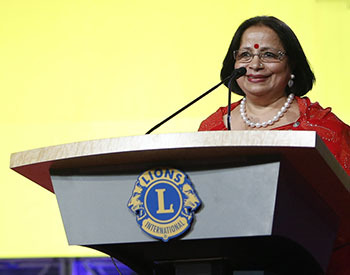 To give her vision a completely new dimension she joined the International Lions club in 1989. 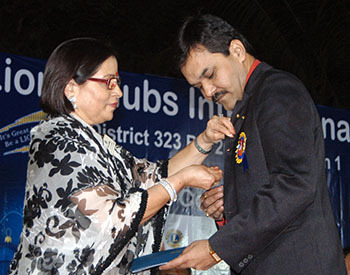 In the year 1999-2000 she became the President of the club in Juhu ( Mumbai) ,being the only woman president till date, climbing rapidly the ladders of lionism, and in 2004-05 she became the District Governor of District 323 A3 ( The first woman to do so). As a lion her contributions include building blood banks, eye care foundations, community welfare centres, sight restoration programs etc. Apart from this she has established several orphanages, schools and medical centres for the benefit of tribal areas. 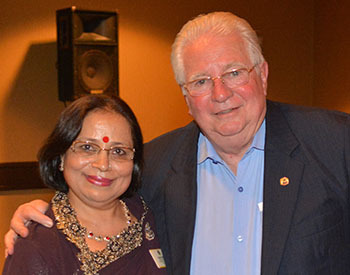 Co President & International Trustee for World Council of Regional Peace. Vice President World Jain Confederation. Special Representative of 54 countries of ISAAME at the International Convention. She is representing the board on Women Task Force at PHD Family welfare. She is overviewing “Child in power” along with other many projects as the Chairperson of Indian Council for Human Relations. 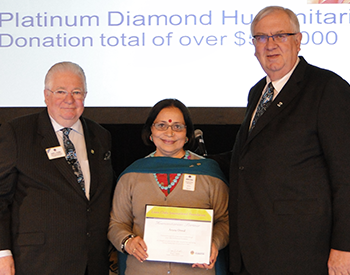 She has recently been offered Honorary Patron of the prestigious President’s Institute. International Presidential Medals and three International Leadership medals. “Jain Ratna Award” by Ex Prime Minister H’nble Shri Atal Bihari Bajpai. Honoured as a woman of substance by Smt. Kiran Bedi. during the Bangkok Convention 2009.